Mondronen Shaman Flip: When transformed, she can punish players for casting spells. Lanzo493 on "Grandma why is your tongue green ?" I'd say that you can take out 2 Voyaging Satyr and 2 Overgrowth so you can put in 4 Utopia Sprawl. Here's why. If you do the setup like that, you will have 6 creatures in your deck that can untap lands, and 6 enchantments that make your lands tap for extra mana, outside of Garruk. That's really balanced. You'll want to have more Utopia Sprawl over Overgrowth because the former costs less mana and comes down earlier in the game. You'd be surprised how much stronger a deck can be when it's made to be faster. On a side note, it'll be a great card if you ever choose to splash a second color into your deck. 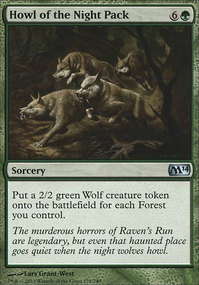 On a different note, I suggest Howlpack Resurgence. As good as Wren's Run Packmaster appears, it can also be a dead card. 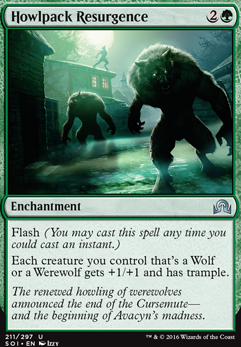 Howl of the Night Pack is a lot more reliable if that's the kind of effect you're looking for. Privileged Position appears like a good card, but for 5 mana you want something that can kill. Triumph of the Hordes or Overrun can do that. Hey Shmookyla! Fellow Werewolf enthusiast here. I play tested your deck against my paper werewolf deck that I'm gonna put a link to once I get it on Tappedout. I did a three round game, and my werewolves came out 2-0, but that really only happened because your deck got landlocked second round. 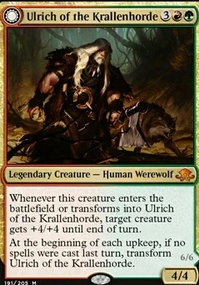 That being said, the strength I saw in the deck playing against it happened when I had a two Lightning Bolts in hand, a flipped Village Messenger Flip and a Smuggler's Copter, but your werewolves had flipped and everything was above 3 toughness. It was quite an ordeal to play against. 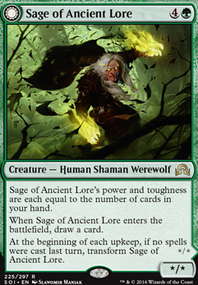 Plus you had Heroic Intervention in hand, so no matter what I did I was taking trample damage from Howlpack Resurgence. It performed fairly decently. The one problem with running no 1/1s was speed. 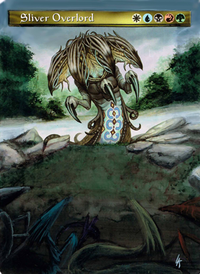 Your deck had to fully devote to one card, every turn, which is ultimately too slow for the human side of the deck. 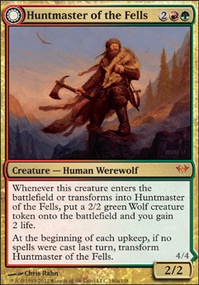 In my humble opinion, I've had a consistent experience using Young Wolf and Village Messenger Flip in conjunction with Smuggler's Copter, Cream of the Crop, and Aethersphere Harvester as protection against flyers and card draw of various types. The thing with werewolves is they need a value engine. I've found, after play testing my wolves against a couple mirror matches, that CoCo usually doesn't come to the rescue often enough and isn't a very consistent experience. For more resilience have you considered Full Moon's Rise similar to Howlpack Resurgence but I feel that rise is better overall. It's cheaper and and can save the pack from most sweeps. But I suppose it would come down to how important it is for you to have the wolf buff from resurgence. Just something else to consider.